Your friend is getting married! Now it’s up to you to find the perfect event for everyone – a murder mystery hen party is just what you’re looking for. Join Maia Millions at her wedding to Avery Hart-Less or celebrate Greta Lovelace’s inheritance of the family fortune (as long as she’s engaged to be married within the next 24 hours) and let our experienced team of murder mystery actors draw you into the story as you turn detective. Or choose to play all the suspects at your murder mystery hen party with two professional actors on hand to make sure everything runs smoothly and everyone has a great night. Our murder mystery hen party events are available across the North East in the hotel of your choice. We come to you and work around your evening plans to make this a hen do the bride-to-be and all the guests will remember. There are no minimum or maximum numbers for our murder mystery hen party nights with our team of actors. And you can choose any of our fun plots! 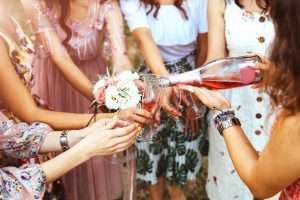 Our murder mystery hen party where you play the suspects requires a minimum of eight people to take the roles and have a maximum of 20 characters available for your guests. A murder mystery is a great way to have all ages join in and have fun. We start from 7pm and keep you entertained until 10.30pm over a three course meal but we can also work our murder mysteries around a buffet or even snacks and drinks.